Ruppell’s Vultures travel almost as much as I do. These enormous birds nest in cliffs rather than trees. Cliffs are great from the standpoint of the chick. They are well protected from predators and the elements, but make a lot of extra work for the parents. Most cliffs in Kenya are very far from protected areas and other places of high wildlife density where the vultures will find most of their food. As a result, Ruppell’s Vultures have to travel far, flying to and from their feeding grounds and the nest every few days. Since the distances can be more than 100 km (70 miles), it is a good thing the vultures are soaring birds. Soaring flight allows them to travel great distances while using very little energy. 3. The huge cliff faces along Gol Mountains just across the border in Tanzania. The costs of travel would be different depending on which of these nests a given bird was using and so one might expect birds from different cliff sites to use different foraging grounds and have varied travel paths. By trapping the birds in Mara, we would get a haphazard sampling, which I had hoped would include birds from each of these cliff sites. In the first year we got birds from Lake Kwenia and the Gol Mountains, but given that only a few individuals use the cliffs at Hell’s Gate we didn’t trap a bird using these cliffs. A few days ago, we got some exciting data suggesting that we actually caught a Hell’s Gate bird this year – just take a look at the map of this bird’s movement. He dropped off right in Hell’s Gate, just in time for the evening’s rest. Another year, another set of birds. During our first year using GSM-GPS telemetry we were able to tag 14 vultures. 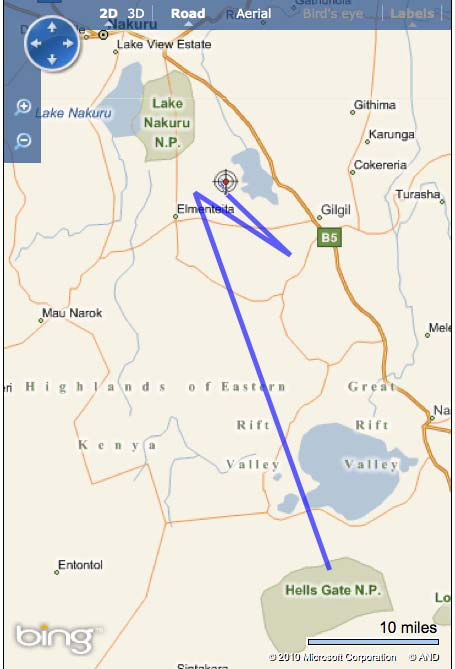 The GSM-GPS units allowed us to follow the vultures for nearly a year, learning valuable information about the areas they use, the speeds and altitudes at which they travel, and sadly the places where they are dying. This year we have attached an additional 18 units and are continuing to follow the vultures. In September I returned to Princeton University to teach and analyze data (the other side of science). Fortunately with the GSM capacity, I am able to download the data from the birds and continue to watch the tagged vultures fly across the great African plains. It is always miraculous to watch them from afar, imagining the beautiful landscape that the birds still travel over. Watching from a distance is a great luxury, but it can also be frustrating. At the beginning of September we lost another bird, our first tagged Ruppell’s Vulture mortality. At my current distance, there is little I can do to determine what has gone wrong, but I’m fortunate to have the help of people in Kenya like Munir Virani and Paul Kirui. During the first week of October, Munir Virani was able to pick up the deceased bird and, while the cause of death remains unknown, we were at the very least able to recover the unit. As in some of the previous cases, the location of the death suggest poisoning, but we won’t really know for sure until the samples come back from the lab.